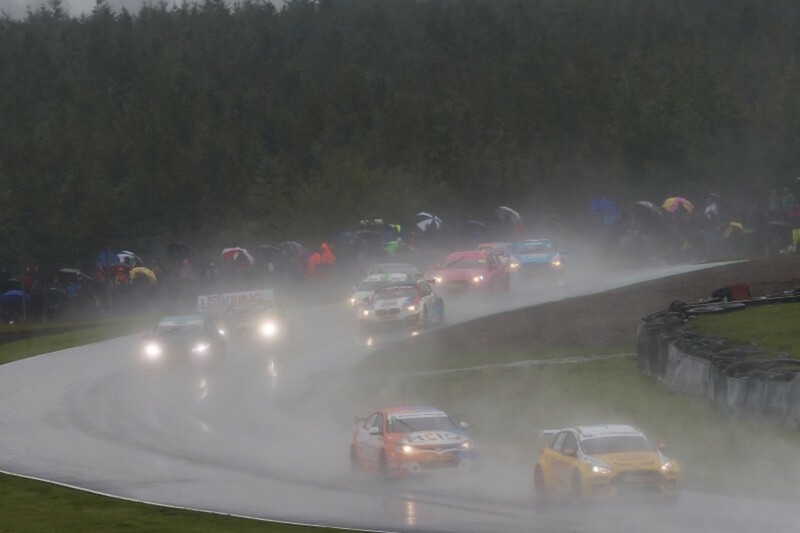 Race day on the annual trip north of the border provided treacherous driving conditions, controversy and a huge lead at the top of the standings for one lucky driver. 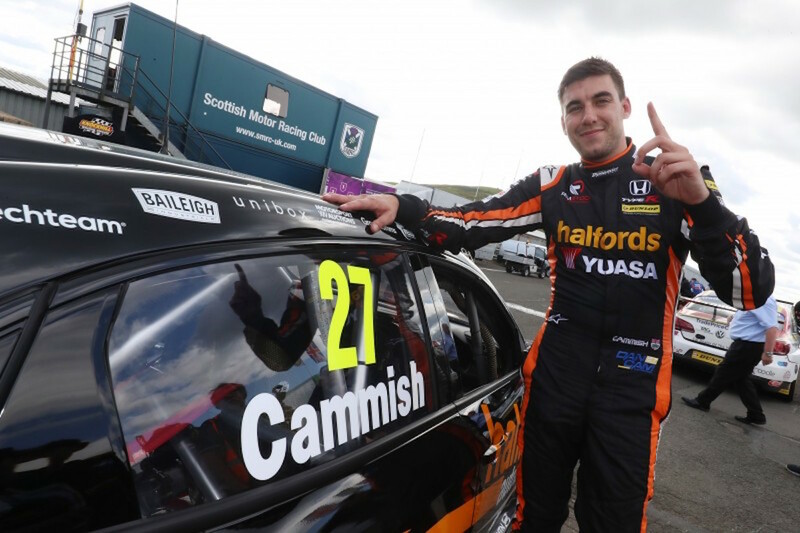 Saturday’s dry qualifying session, on the freshly resurfaced track, produced the fastest ever lap around Knockhill and a maiden pole position for Dan Cammish. Stephen Jelley, who’d only managed two points all season, was a surprising second with a more familiar look of Andrew Jordan and Colin Turkington on the second row. Turkington’s main challengers going into the weekend, Tom Ingram and Ash Sutton, weren’t far behind in sixth and eighth. 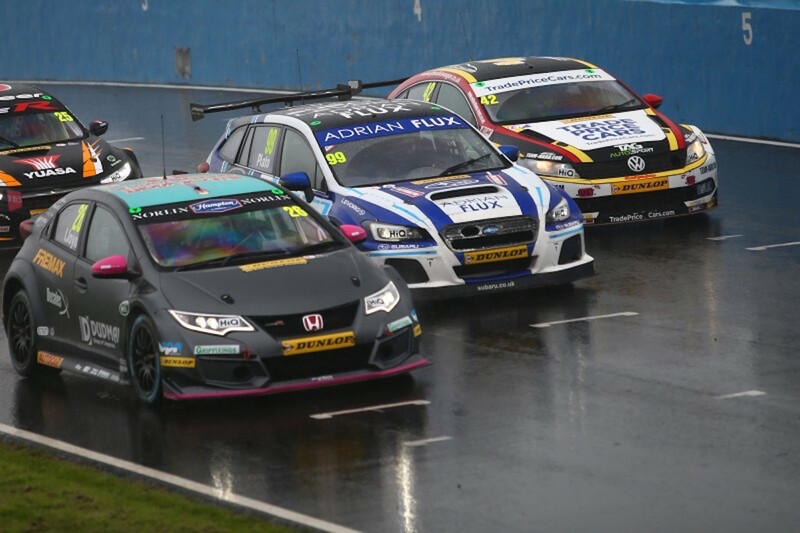 Race two:Turkington was allowed to keep his second place from race one, although he was officially reprimanded and given two penalty points, meaning he started alongside Sutton for the second race of the day in conditions that had worsened. Race two was ruined by safety cars and ultimately a red flag. The first lengthy safety car period came on the opening lap after Ollie Jackson’s Audi found its way into the barriers. After the re-start, Carl Boardley ended up in the tyres, but luckily it was just enough out of the way to prevent a second safety car. Major controversy hit winner Sutton and runner-up Ingram post-race, as both cars failed the ride height checks, resulting in disqualification. All appeals were dismissed meaning Jordan inherited victory, his first of the season, with Josh Cook second and Cammish third. 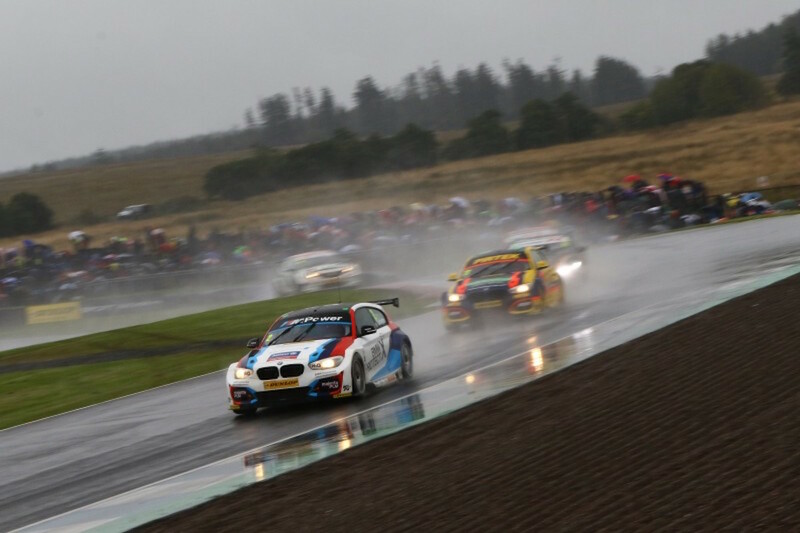 Turkington moved up to fourth as he increased his lead at the top of the championship. Race three: Sutton and Ingram both started the final race of the day, in better but still damp conditions, from the back of the grid and with their success ballast from race two. Turkington had been drawn on pole, but relinquished the honour to Tom Chilton following the dramatic events after the second race. 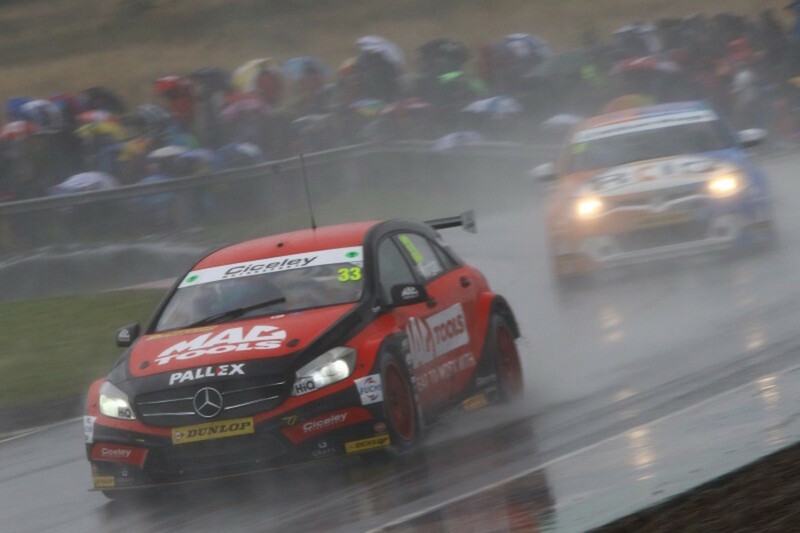 Adam Morgan joined Chilton on the front row and the top three got away well off the line, but on lap three as Chilton was starting to create a gap at the front and Turkington was closing on Morgan, the safety car was called for, again. A collision between several drivers left Mike Bushell’s car stranded and gravel all over the track at the hairpin, which took some time to clear. As the race went live again, Cammish struggled massively and dropped well down the pack as there were strong drives from Rory Butcher, Jordan and Cook. Turkington spent several laps all over Morgan before finally securing a safe pass and he set off after Chilton, who he duly caught. However, despite pressurising Chilton to begin with, Turkington seemed to ease off and bank the points as his closest rival Ingram was struggling to get through the field despite a valiant effort. Sutton, meanwhile, was producing the drive of a reigning champion as he made pass after pass to finish an amazing eighth after starting at the back. After all the drama of the day, it meant that Turkington left Scotland with a not to be sniffed at 43 point lead at the top of the championship. Yes, luck played its part, but that should not distract from a set of impressive results for the Northern Irishman. A brace of seconds and a sixth (fourth) was the high-end consistency that he needed at this stage of the season. In the previous rounds, Ingram has charged through the field on both occasions in the second race to score quite incredible podiums – championship standard winning drives it could be said. Sutton has looked like a completely different animal since Croft and has serious momentum on his side. His Subaru looked unstoppable at Knockhill and it was a genuine possibility that he could have won all three races had he now been disqualified, that good was his car and attitude. Had Turkington produced anything similar? No, but he has been consistently working away to secure the championship and it would seem like the odds are now very much in his favour after Knockhill. Many on social media were calling for Turkington to penalised for his incident with Jelley and for him to be thrown out of the race for ruining Jelley’s weekend. How many times have we seen this happen though? It happens almost every weekend, but just not as high-profile as the championship leader taking out someone who’s up there for the first time on merit. Let’s not forget, Turkington waspenalised and if it had been his third strike of the season he would have started the next race from the back of the grid, but it wasn’t. However, he’s now got to keep it clean for another six races. Not that this plays a role in the decision of the stewards, but how many times has Turkington fallen foul of bad luck when trying to drive fairly? Maybe it was his time to be on the good side for once, or perhaps more than once considering Sutton and Ingram’s disqualification. Again, a social media outcry followed the ‘unfairness’ of them not only being disqualified, but having to start at the back of the grid with their success ballast. Unfortunately, the rule book states otherwise. The rest of the grid were legal, so why should there be exceptions, just to make the championship more interesting? In fairness, Ingram and Sutton took the decision admirably, understanding that rules are rules. There was no hidden agenda from TOCA, just the following of the rule book for both Turkington’s incident and Sutton and Ingram’s ride height failure. Even with a 43 point lead, Turkington won’t be sleeping easily with the knowledge that Sutton is flying after winning half of the last twelve races, sort of, and Ingram producing sterling comebacks after suffering bad luck. Silverstone will not be easy for Turkington as the 75kg success ballast will seriously hamper his speed, but for some reason, the success ballast looks to be carried much more effectively by Sutton and, to some extent, Ingram. If Turkington can leave Silverstone with a 30 point lead, you would still favour him going into Brands Hatch, but, as ever, the BTCC is as unpredictable as it gets. Bring. It. On. 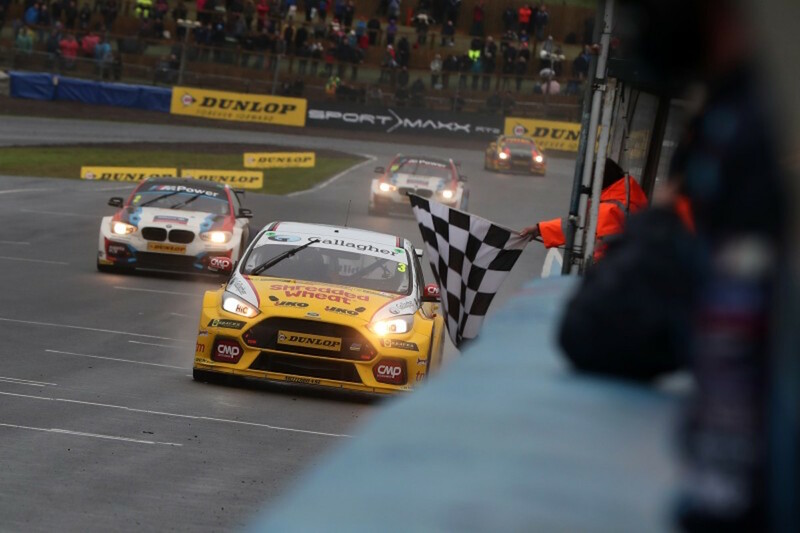 Previous Post BTCC 2018 | What happened at Rockingham? Next Post BTCC 2018 | What happened last time out at Silverstone?